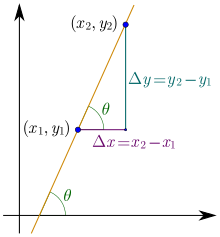 In mathematics, the slope or gradient o a line is a nummer that describes baith the direction an the steepness o the line. ↑ Clapham, C.; Nicholson, J. (2009). "Oxford Concise Dictionary of Mathematics, Gradient" (PDF). Addison-Wesley. p. 348. Archived frae the oreeginal (PDF) on 29 October 2013. Retrieved 1 September 2013. This page wis last eeditit on 28 Februar 2018, at 05:32.